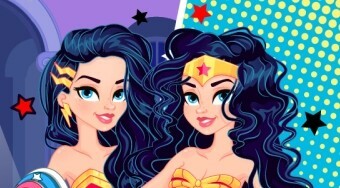 Do you like Wonder Woman Fashion Event? Share it with your friends. Wonder Woman Fashion Event is a wonderful girl game in which the beautiful super heroine Diana is invited to a prestigious fashion party. Your task is to choose for her hairstyles, dresses and fashion accessories. But during the party, Diana will have to bounce back to help people in need. So there's nothing left to dress her into her super heroic costume.